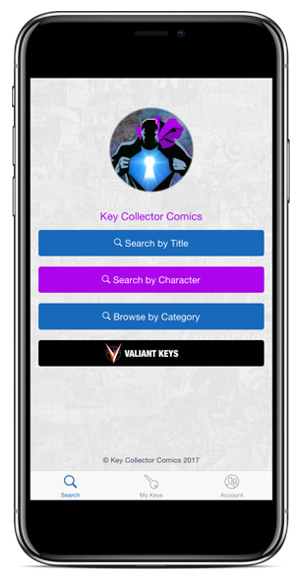 Valiant Entertainment is proud to announce that it has joined forces with Key Collector Comics – currently available for iOS and Android – for their first official publisher partnership! The free-to-download mobile app aims to make collecting the most seminal single issues from across the renowned publisher’s 25-year history easier than ever before with a complete list of Valiant's biggest and most sought-after milestones! • HARBINGER #0 (1992) Pink Variant – a highly sought-after mailaway issue revealing the origin of the Renegades! • ETERNAL WARRIOR #4 (1994) – featuring the first cameo appearance by Bloodshot! • QUANTUM AND WOODY #3 (1997) – featuring the first appearance of Vincent Van Goat (aka “The Goat”)! • X-O MANOWAR #1 (2017) Brushed Metal Variant – Valiant’s first brushed metal variant cover printed via a special process on an actual brushed aluminum metal sheet! • ETERNITY #1 (2017) Massafera Variant – a rare 1:40 wraparound variant cover introducing the complete cast of the visionary new series by Matt Kindt and Trevor Hairsine, featuring fully painted cover art by Felipe Massafera! The Key Collector Comics app is a concise and comprehensive resource that isolates issues of significance from the clutter of uneventful comics. 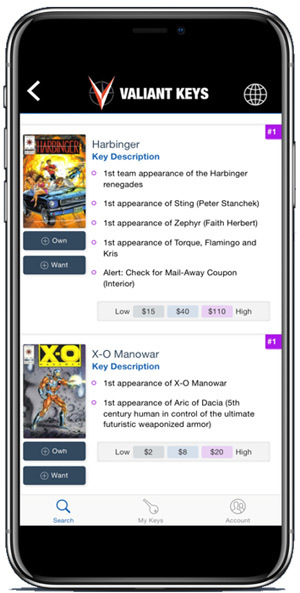 It features information regarding over 7,000 key issue comic books, as well as a simplified price guide, robust search filters, and a cataloguing system to determine the value of your own collection. Do you you use other methods to price books? Let us know in the comment section below. Also don't forget to Like, Share and Subscribe to all things Constant Collectible so YOU can stay up to date with all the news and reviews from a world of GEEK CULTURE. Dec 14 Andy Diggle & Stephen Segovia Descend into Valiant’s SHADOWMAN #1 Coming in March!